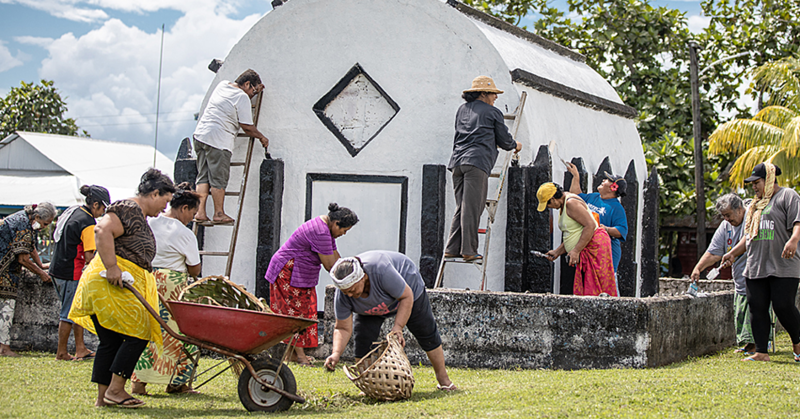 Two Samoan schools recently received donations of furniture, supplies, and labour through a partnership between Furniture for Schools Charitable Trust and The Church of Jesus Christ of Latter-day Saints. 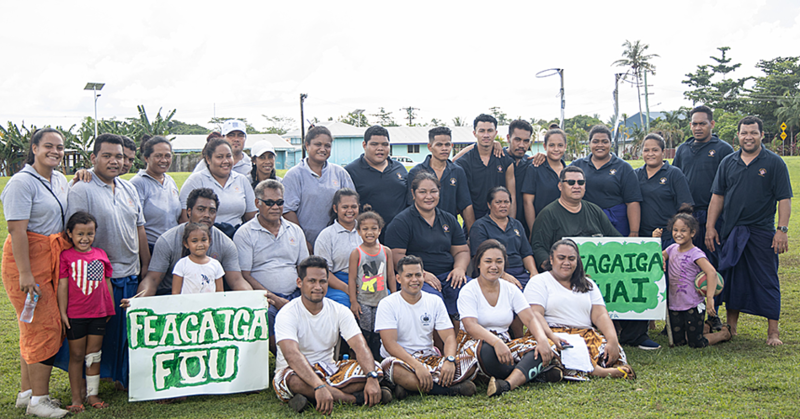 Pesega Fou Primary, a public school in Apia Samoa, was gifted 40 used table desks donated to the Furniture for Schools Charitable Trust by schools in New Zealand. They were shipped, unloaded and distributed by LDS Charities. But the small classrooms at the school had no room for chairs to go with the desks. The students sit on floor mats. A creative solution was needed. Elder Clifford Vellinga and Elder Rusty Gillett, senior missionaries for The Church of Jesus Christ of Latter-day Saints, were up to the challenge. “We pondered a solution and were inspired to shorten the desk legs,” said Vellinga. By cutting off several inches they were able to create table desks that provide a writing surface for the four to six students who sit around them on floor mats. Now the students have a place to write and draw, and everyone is happy with the outcome. Several boxes of used books and three large tubs of new school supplies donated through Furniture for Schools were also delivered to the school. The donations were received with great appreciation from the school faculty and students. Principal Repeka Toleafoa Toala said, “The desks and supplies were greatly appreciated, especially by the children. They now have a place to call their own as they put their backpacks under their desks where they sit. The values of service, education, and brotherhood taught in the Church resulted in another donation to the Pesega Fou Primary School around the same time the furniture was delivered. The Neal Cox family, of Utah in the United States have a love for the people of Samoa and lived there many years ago while Cox taught at Pesega High School. Preston Howe, a grandson of Cox, organized a Boy Scout Eagle Project to collect and assemble dental hygiene kits for the students. His family joined in and collected laptops as a service project in remembrance of those years. The donations of laptops dovetailed nicely into the furniture and school supply donations delivered by LDS Charities. 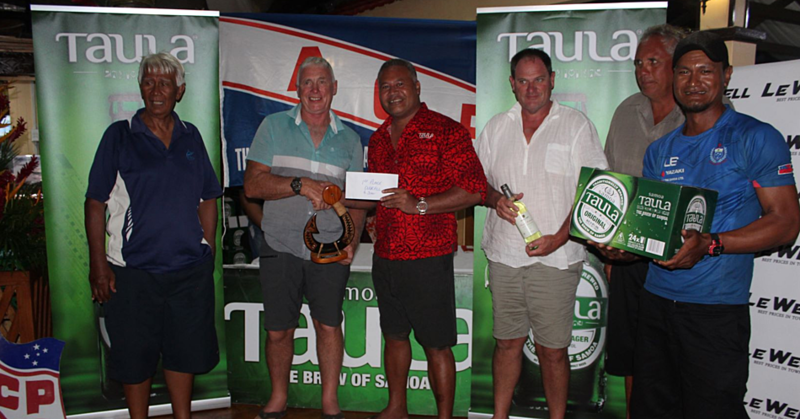 Members of the family travelled to Samoa to deliver their donations. LDS Charities does much to put into practice what the Church preaches including supporting schools of its own and reaching out to assist other schools around the world. Sataoa Primary School also recently received a shipment of desks and supplies from Furniture for Schools Charitable Trust delivered by LDS Charities. He continued: “In-country Latter-day Saint staff also see first-hand the amount of good it achieves with whole villages or communities…which improves the chances of young people in the islands succeeding in their communities with a heightened level or sense of education and…ultimately the contribution they can make to their own nation.